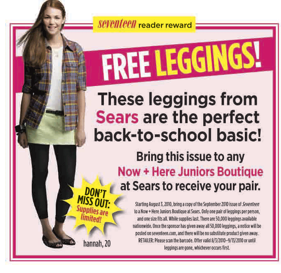 Sears: Free Leggings with Seventeen Magazine Cover (Sept)! If you have a September issue of Seventeen then head on over to Sears into the Now+Here Juniors Boutique to receive a free pair of Leggings. It is limited to 50,000 nationwide. They will post on Seventeen.com when they have meet the limit. You can head over here to check out more information. Shoebuy: $10 off $25 Bags, Luggage & Accessories + Free Shipping!